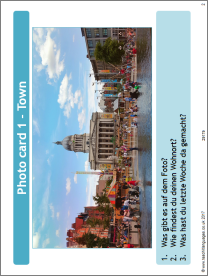 10 German photo cards for foundation tier speaking related to the local, national and international theme. Additional questions for each slide are also provided in the PowerPoint notes as well as in the Word document, which could be used to support paired speaking practice. Frustrating as the free PDF file only contains the suggested unprepared questions for the photo cards but without the actual photo cards (which are presumably available in the PowerPoint) the PDF file is useless!